Potentially catastrophic problems during labor and delivery can’t be addressed if the physicians and nurses responsible for the well-being of the mother and baby are unaware of them. Irregularities with the child’s heart rate while in utero can lead to severe birth injuries. That is why fetal heart rate monitoring errors can be so devastating. When doctors make fetal heart rate monitoring errors, the experienced Washington DC birth injury attorneys at The Rich Firm, PC work with families who have been affected by such avoidable medical mistakes, getting them the resources and compensation they need and deserve. Throughout labor and delivery, both the mother and baby need to monitored closely for any signs of fetal distress. Abnormal or irregular fetal heart rate is one of the key indicators of potential problems with the health of the baby. An abnormal fetal heart rate can be a sign of neonatal asphyxia, which is oxygen deprivation during labor or delivery. It could be an indicator that there is not enough oxygen in the child’s blood, a condition called hypoxia, or it could mean that not enough oxygen is flowing to the brain, known as ischemia. Significant irregularities with a fetal heartbeat can usually be addressed by providing oxygen to the mother, proceeding with an emergency Cesarean section, or other immediate steps. But these vital actions might only be taken if the irregular heartbeat is detected by those responsible for the child’s well-being. 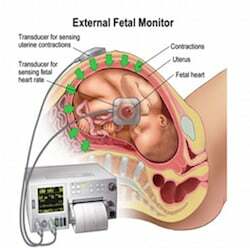 Given the importance of monitoring fetal heartbeat during labor and delivery, it has become common practice to use electronic fetal heartbeat monitors that are designed to keep delivery room staff apprised of the baby’s heart rate on a continuous basis. But such machines are only as good as the people who use them. The medical team’s lack of experience, skill, or care in using or interpreting the results of a fetal heart rate monitor can lead to crucial errors. When medical staff fail to take the immediate actions necessary to avoid birth injuries that could have been prevented had the staff properly responded to the monitor’s results, it can be the basis of a medical malpractice claim. If you suspect that your child is the victim of a birth injury caused by the failure of your physicians to monitor your baby’s heart rate during labor and delivery, the Washington DC birth injury attorneys at The Rich Firm, PC can help. Several of our attorneys are also medical doctors who can in many cases very quickly evaluate whether your doctor was negligent, saving you the months and expenses normally associated with expert review of your case. We are committed to the well-being of our clients and fight tirelessly to get them the compensation and justice they deserve. For experienced and aggressive birth injury lawyers in Washington DC, please give us a call at 888-RICH-LAW (742-4529) to set up your free consultation, or contact us online. We look forward to assisting you.